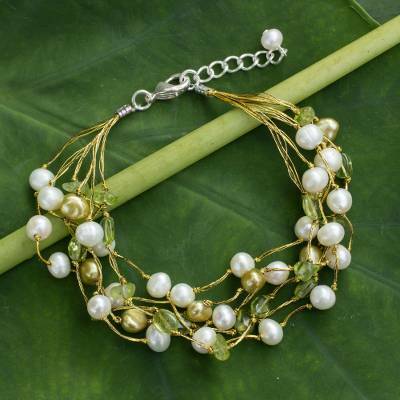 Artisan Crafted Peridot and Pearl Bracelet, "Cloud Forest"
Beautiful gemstones evoke a cloud forest as Sasina creates this feminine bracelet. Knotted by hand on silk strands, green and white pearls combine with cool peridot. The clasp and extender chain are bathed in sterling silver. You can find cultured pearl and peridot beaded bracelet 'Cloud Forest' by Sasina in jewelry categories such as Birthstone Bracelets, Pearl Bracelets, PEARL Dyed Bracelets, PEARL Cultured Bracelets, Peridot Bracelets, Brass Bracelets, Silver Plated Bracelets, Silk Bracelets and Beaded Bracelets. Enjoy exploring these sections for other Novica treasures. Sasina has received a $2850 microcredit loan with 0% interest. Proceeds were used to cover her team's daily salaries, as well as invest in the purchase of gemstones and other components for production. Sasina gives jobs to others at her workshop and has realized her dream of working on her own. I bought this bracelet for a friend who is very particular about jewelry, she loves it and wears it all the time. It is very nice summer bracelet. "I believe in the power of stones. Before leaving home, I wear an accessory – preferably earrings – that features at least one type of lucky stone…." "My name is Sasina Leerasawatdiampon. My hometown is located in the north of Thailand where the air is fresh and the landscapes are beautiful. I really love this place. I have an older sister and my parents work with agricultural products. "My parents use to have a big garden filled with fruits and flowers which they started out of personal choice. It grew so much they started to sell their produce and be able to make a living from it. This is the kind of environment I grew up in, one were I could walk and admire the beautiful flowers, which I would pick to decorate my room. "One day I was trying to get an outfit together for a party I was invited to, so I decided to use some of the flowers as accessories. I made some lovely jewelry with it, and I also wore some on my hair, to the point where I thought I had overdone it, but didn't have time to change. Everyone at the party admired my creations so much, they made me feel like a princess. "I craft jewelry with my good friend Busarin, who is also a Novica-featured artisan. I love jewelry so much that the need to adorn my body with it is mandatory. My favorite is the earring, because it is little yet can subtly decorate the wearer. I believe in the power of stones. Before leaving home, I wear an accessory – preferably earrings – that features at least one type of lucky stone, not only for luck, but also because I believe I will then meet only good things. "I have been fashion-conscious and loved beauty for a long time. As a young girl, I had already started to make earrings, bracelets and necklaces. I used my imagination to create simple designs with simple materials in my spare time. But it was while studying at the university that I began creating accessories. Initially I made what I liked and sold some to friends. But I started to receive orders and ended up spending more time filling orders than creating new designs or doing anything else in fact, which was good anyway in terms of sales. "I eventually graduated with a Bachelor's Degree in accounting from the School of Business Administration and began looking for a job because I wanted to have enough money to start running my own business. Of course I could have simply helped with my parents' but I had been planning to have my own for a while. I dreamed about it and was prepared for it and would settle for nothing else. "After university I began to work for a big finance company, but I didn’t like it all. Being the youngest member in the team meant I had to do everyone else's tasks and I was under a lot of stress. I missed being able to design, so after a couple of years I resigned. "There is an important thing I would like to say to my clients worldwide. A part of what I earn with my jewelry will be donated to an orphanage. I would like to participate in giving these children a chance to grow and live, and so will you when you purchase my products. Thank you very much, from the bottom of my heart." A perfect 50th Birthday gift for my sister! Thank you! This beautiful necklace is just what I needed to complete my wedding-outfit. I love it! The person for whom I bought this absolutely loved it. Very feminine and delicate. Home run gift!